# available, be sure to check the documentation. It’s possible to supply a block to console to be evaluated when the Rails environment is loaded via the terminal. This enables you to set console-specific configurations. I like saving some typing with helper methods like this one. You can test named routes in the console directly using the special app object. It’s possible to add :except and :only options to the call to resources in order to limit the routes generated. New to Rails 4 is the capability to register your own flash types by using the new ActionController::Flash.add_flash_types macro style method. When a flash type is registered, a special flash accessor, similar to alert and notice, becomes available to be used with redirect_to. redirect_to post_url(@post), error: "Something went wrong!" If the migration name is of the form “AddXXXToYYY” or “RemoveXXXFromYYY” and is followed by a list of column names and types then a migration containing the appropriate add_column and remove_column statements will be created. The migration generator will produce join tables if “JoinTable” is part of the name. It’s actually super common to forget to add something to a migration. Rails gives you rails db:migrate:redo as a convenient way to rollback and re-migrate in one command. The db:setup creates the database for the current environment, loads the schema from db/schema.rb, then loads the seed data. It’s used when you’re setting up an existing project for the first time on a development workstation. The similar db:reset task does the same thing except that it drops and recreates the database first. Hmm… I know some of those words. Ok, maybe we’ll come back to Rails later. What else do I use a lot? Let’s try the Bootstrap repo. Again, you head to the issues tab and find a bunch of text seemingly written in a different language. In my experience, this is where the doubt starts to creep in. Maybe I’m not good enough to help with open source. Maybe I’ll never be good enough to help with open source. Ok, stop right there. You absolutely can contribute to open source at your current skill level. Are you going to submit an amazing patch to Rails as your first pull request? Incredibly unlikely. Popular projects like Rails have a huge number of moving parts and a lot of very smart, experienced people working on them. Your three months of Rails experience are not going to get you very far into fixing Rails bugs. However, if you move down to some slightly less popular gems and projects, you can start to find and fix bugs pretty easily. Here are a few examples of how I did just that. I ran the script again and it worked. Great, I fixed the bug! Now how do I get this fix added to the main repo? Creating a pull request on a real project seems intimidating until you do it a couple times and realize how shockingly easy it is. For a small fix like this, you don’t even have to manually fork the repo. Just click on the file you want to change in the repo and then click the pencil icon in the upper right corner of the file. Make your edits to the file and add a title and description of what you are changing in the pull request. That’s it! Submit your pull request and wait for a maintainer of the project to accept it. Do you see how easy that was? I didn’t even write any code. All I did was delete two spaces. You have to think about the context of what deleting those two spaces means though. This script has over 5,000 stars on GitHub. The commit that broke the script was made three months before I submitted the fix. That means possibly hundreds of users had tried to use this script and had it fail on them. It turns out deleting those two spaces was actually pretty helpful. Never underestimate the power of fixing small bugs. I used Rails Composer for a ton of projects during and after the bootcamp I attended. It’s great for quickly getting a project going and trying out a bunch of different options for things like front end frameworks and authentication gems. I love Rails Composer, but there was always one small problem that drove me nuts. On the left is the Rails Composer Bootstrap alert. On the right is a standard Bootstrap alert. See the difference? It’s the wrong color and not vertically centered. It drove me insane. I just lived with it for a while, but one day I was poking around in the Bootstrap docs and realized what was missing from the Rails Composer alerts! There is a class called alert-dismissible that takes care of the position and color of the close icon. Adding that class to the alert div immediately fixed the problem. So I just add that class to the Rails Composer repo and call it fixed, right? Well here’s another tip for contributing to open source: Make sure you read the Contributing section. I didn’t take this advice, and my original pull request is still open to this day. A few months later I realized my mistake, and after some poking around I found out that I was supposed to add my changes to the RailsLayout gem. Again, we aren’t talking about huge changes here. I just added a single CSS class. However, I know that a ton of beginners use Rails Composer to make their applications. I probably just made hundreds, if not thousands, of blogs and Twitter clones look just a tiny bit better. This last example is an even simpler way to contribute to open source: submitting issues. Open source projects really appreciate well-written bug reports, and as a developer you are in a great position to provide those bug reports. 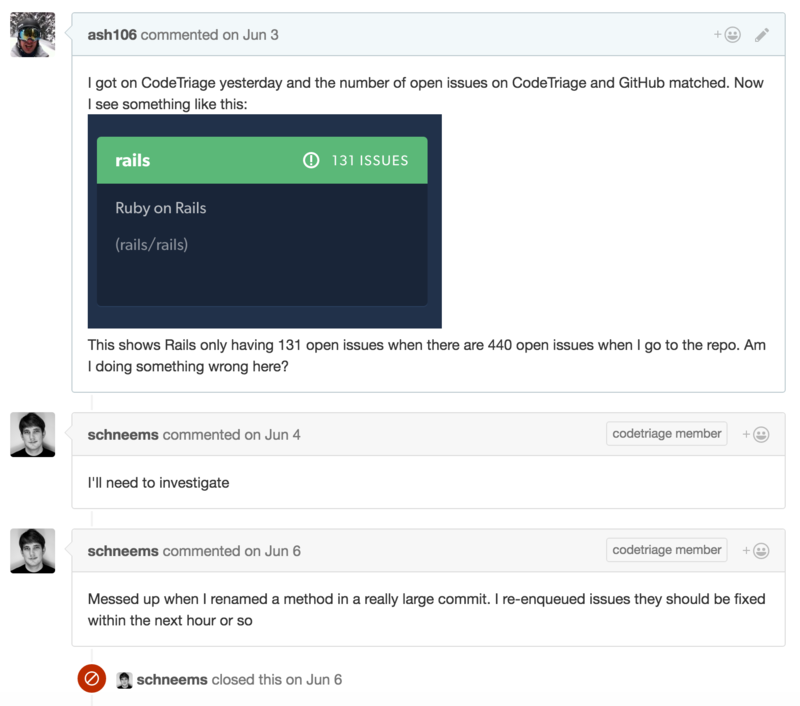 I was recently using a site called CodeTriage to find open source projects to contribute to. I noticed that the number of issues on the homepage didn’t match the number of issues for the actual repo on GitHub, so I wrote up an issue. I provided as much detail as I could about the bug (which was pretty simple in this case), and the project maintainer was able to find and fix the bug within a couple days. I hope by now the point of this post is starting to sink in. If you want to start contributing to open source, start fixing small things right now. These are all real examples of contributions I’ve made. None of them are very hard to do, but add enough of them together and you start being pretty helpful. Go check out some of your most used repos, or get on CodeTriage and find a project that looks interesting. I promise there is something you can start doing right now!